The AGM of the Society was held on Friday 20th April 2018 at Devon Hotel, Matford, Exeter when 20 members of the Society were assembled. The Chairman, David Phillips opened the AGM at 6pm. After noting apologies the Chairman received approval for the 2017 AGM minutes (previously circulated in the 2018 Magazine). The Committee had met three times during the year and proved a useful sounding board to the running of the Society. David Phillips expressed his thanks to the Committee for the 3 years in which he had the privilege to be Chairman of the OH Society. The Treasurer provided a commentary to the accounts of both the OH Society and the Endowment Fund and declared that he was happy with the sound financial basis we have. The Membership Secretary reported that the latest membership was 405 with the Society having recorded the deaths of 5 members since the last AGM. The proposed new and remaining officers plus Committee Members were elected en-bloc. The new Chairman made a few short remarks and thanked the Society for giving him the opportunity to take on the role of Chairman. The meeting concluded giving members the opportunity to obtain a drink before the Annual Dinner at 7pm. Please note that this is a brief summary, the Secretary will produce the full minutes in due course and the draft minutes will be published in the 2019 magazine and then put to the next AGM for approval. 40 members then met for the Annual Dinner at the Devon Hotel. After a lovely meal the Secretary (David Phillips) introduced the speaker Simon Carter. Simon entertained those present with recollections of his time at Hele’s School (81-85) and also about the career he had pursued as a Sports Journalist. He spoke about being a life-long Exeter City FC fan and about his autobiography ‘Exeter City FC (Gus Honeybun… Your Boys Took One Hell of a Beating: A Love Affair in the Lower Leagues)’. The book contains amusing anecdotes, many about being a life-long supporter of Exeter City FC and also about his time at both Ladysmith School and Hele’s School. A very sociable evening was concluded with a draw for Society funds and we finished at 10pm. Next year’s AGM and Annual Dinner date have not yet been agreed but will be publicised as soon possible. 1. Summer Dinner and Social Evening – Thursday 12 July at Exeter Golf & Country Club. Please see details and the application form posted in the Events page on the website. The dinner is open to all Society Members, wives and partners. It is limited however to a maximum number of 60 and applications will be on a first come basis. Allow me to open this my first Christmas message as Chairman of your Society with a hearty and warm welcome to all of you, my fellow Old Heleans. 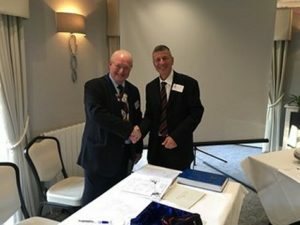 I was elected as Chairman at the Annual Meeting on 20th April 2018 and this was not only an honour which I was pleased to accept but equally I was under no illusion that it will be a hard act to follow David Phillips who had been your Chairman for the previous three years. Thankfully David has agreed to continue as Secretary to the OHS. Whilst pondering what news to bring to you I reminiced about my own time at the School. My years were not as long as some but I remember with great fondness my three years (Nov.1968 –July 1971). My father’s job brought his family south from Scotland to Exeter and Exeter City Council’s Director of Education arranged for us to meet with the Headmaster, Mr. Medlar. At least we thought it was a meeting whilst Mr. Medlar was clearly conducting an interview, which thankfully I passed! Sadly I have to report that the number of members is currently 401 a slight drop since the AGM (405) due to deaths and resignations. On 4 July the Svendsen Brothers (contemporaries of your President, John Langdon) were in Exeter and kindly invited members of the Committee to join them for dinner. It was a very enjoyable evening and a pleasure to hear the reminicences of all three ‘senior’ members of the Society. Whilst in this social mode I am pleased to report that two other functions were held for Society members, partners and guests during the summer, firstly on 12 July at the Exeter Golf & Country Club a summer dinner, in the updated Mews Suite was held and we had a very convivial evening. including 6 Committee members who travelled up from Devon) and if you can support Derek in this venture I know it will be greatly appreciated. Low dining numbers may lead to a re-appraisal of this event’s viability however.Please visit the Society’s website at www.oldheleanssociety.org.uk for up to date information. I am currently working with our webmaster to refresh the information and news items, hopefully in time for the new year.The 2019 annual general meeting and dinner will once again be at the Devon Hotel on Friday 26 April 2019, taking into account the feedback received at the last AGM/Dinner, the Committee did consider other locations but decided to remain at a trusted venue. Please note the timings with an earlier 7pm dining time (as requested). Best wishes to all for a very happy Christmas and a good New Year.